My 73-year-old uncle Dr. William John Cameron Sr. recently died. Here are some photos from his funeral as well as his obituary. Dr. William John Cameron Sr.
John Cameron passed away on Sunday, May 17, 2015 at the Veterans Hospital in Durham, North Carolina from complication from heart, liver, and kidney ailments. He was born in Louisburg, NC on September 13, 1941 to John Lansing Cameron (deceased) and Beulah Bradley Cameron of Raleigh, NC. In addition to his mother, he is survived by his loving wife Joan Gilbreth Mabes Cameron, siblings Ann Cameron Pearce (Irvin) of Raleigh, NC, and David Bradley Cameron (Martha) of Union Mills, NC. Also, he is survived by his children, William John Cameron, Jr. of Stafford, VA, James Chadwick Cameron of Orlando, FL, David Lansing Cameron (Marte) of Kristiansand, Norway, George Dewey Mabes, IV of Eden, NC, and Molly Elizabeth Mabes of Charlotte, NC, and his grandchildren Josh, Jacob, Eva, and Liv. 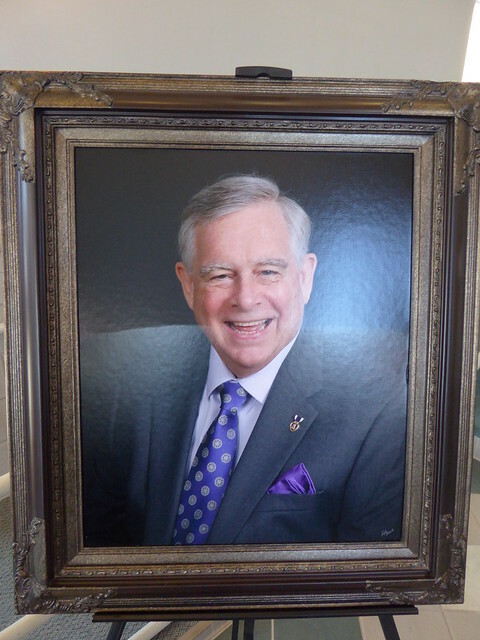 He grew up in Raleigh and was the permanent Vice President of the 1959 Senior Class of Needam Broughton High School. His formal education included three degrees from North Carolina State University: B.S. in Civil Engineering, M.S. and Ph.D. in Transportation Engineering plus a Master of Regional Planning from the University of North Carolina. He was proud to have been a member of the Sigma Chi fraternity. His honor societies were many: Thirty & Three, Blue Key, Chi Epsilon Civil Engineering, Gold Chain, Phi Kappa Phi, Scabbard & Blade of ROTC, and Sigma Xi Scientific. He also enjoyed being part of the marching and Symphonic Bands and the Varsity Track & Field high hurdles team. He served as Chairman of both the Honor Code Board and the Honor Study Commission. His leadership skills were evident as his classmates voted him the permanent Vice Present of the class of 1963. Service to his country was very important to him as he was on active duty in the U.S. Army for two years. He was assigned as a MACV Phoenix Advisor in Military Intelligence during the war in Vietnam. His service medals are many: Army Commendation, Bronze Star, National Defense Service, Purple Heart, Vietnam Campaign, and Vietnam Service Medal with two Overseas Service Bars. He began his career as a Transportation Planner for the North Carolina Division of Administration, soon becoming Assistant Secretary of the North Carolina Department of Transportation. Moving to Washington, DC, he helped form Ernst & Young National Transportation Management Consulting Group, where he was a partner for many years. Branching out on his own, he became Partner of TransManagement, Inc. and then Managing Partner of TransTech Management, Inc. Following the example of his parents and other family members, service to his community was very important to him. In Falls Church, VA, he served on City Council, Planning Commission, Village Preservation & Improvement Society, and as chairman of the Public Utilities Committee. He was on the Land Use Policy Committee for the Metropolitan Washington (DC) Council of Governments. In Eden, NC, he was President of the 2005 Preservation Society Committee. In tribute to his birth city, he cherished his time on the Louisburg College Board of Trustees, serving on the Strategic Planning Committee, as Vice-Chairman, and ultimately as Chairman for six years. The professional organizations he served included the Institute of Transportation Engineers, Preservation North Carolina, and the statewide Board of Directors of the North Carolina Community Foundation (NCCF), where he also served on the grants committee. (The NCCF administers grants and scholarships across the state and inspires philanthropy in the communities throughout North Carolina, including Rockingham County through its local affiliate.) He stretched beyond local involvement by serving on the University of Texas Board of Directors. Giving back to NCSU as a loyal alum, he was proud to work with their Institute for Transportation Research & Education. He also enjoyed being on the NCSU Alumni Board of Directors as well as the University’s Foundation Board of Directors. A dedicated Christian, John was always closely involved in his church. At Hayes Barton United Methodist Church, Raleigh, NC, he was President of both the Junior and Senior High Methodist Youth Fellowships. Family activities dominated his time at Dulin United Methodist Church, Falls Church, VA. While a member of Falls Church Presbyterian Church, he served on the Session and was Chairman of the Personnel Committee. Leadership positions he held at Leaksville United Methodist Church, Eden, NC included being on the Church Council, being Chairman of three committees: the Organ Committee, the Stewardship Committee, and the Worship Committee. His later years found him relishing in the marvelous preaching and music and West Market Street United Methodist Church, Greensboro, NC, and the wonderful supportive friends he made there. His Scottish heritage was very important to John, prompting him to travel to Scotland and tour there on four different occasions over his lifetime. The Cameron Clan was always high on his list of topics to learn about and to share. This gentle man will be missed on this earth by those who will always love him. We rest in the knowledge that his spirit is with those who have gone on before and he is encompassed by the hands of his Savior.